Note: ONLY GameMaker. Studio Professional users have access to Spine functionality. GameMaker: Studio now supports this type of animated sprite, as it can import files created using the program Spine, which is a fantastic tool for creating skeletal animations (you can find out more about Spine here). Note that Spine is a very powerful program with lots of possibilities and there is not nearly enough room in one short article to explain how it all works! We will however give a brief overview of some key points that are related to the way that GameMaker: Studio implements skeletal animation sprites. 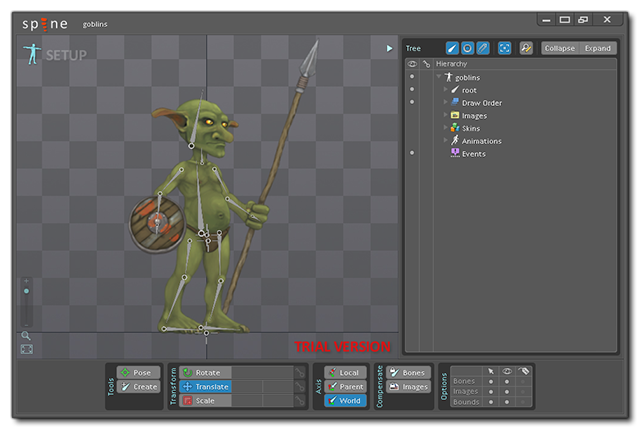 Spine works by having you create a "skeleton" and then pose it to create animations. The skeleton is composed of "bones", which can be attached and moved in relation to one another over a set time-frame, and the final animation can be "skinned" (ie: given a texture) for the final animation. This animation can then be exported either as a bitmap sprite strip, or as a Spine JSON file for adding into your game in GameMaker: Studio. If you are simply exporting a bitmap sprite, then you can stop reading here, as there really isn't much more to say since the method for creating and using "normal" sprites is well known, however if you export the animation using the Spine JSON format export, it permits you to do far more things with your Spine animation than a simple sprite strip. For example, you can have a single sprite and create multiple animations for it (for example a walking, running and jumping animation set), you can create multiple skins for your animation, so that a single skeleton can be skinned differently to create multiple characters (all with the same movements, of course), and you can also give your sprites "attachments" to change their look further. All these things are available to use in GameMaker: Studio too when importing JSON sprites. Before getting into GameMaker: Studio side of things, it's worth going over a few key concepts when using Spine. The first of these is that you need to name your bones and a few other things, and that these names will be what you use as your "handle" into the animations when working with them in GameMaker: Studio, therefore try and keep them memorable and consistent. You will also want to pay attention to where the root is in your animation. 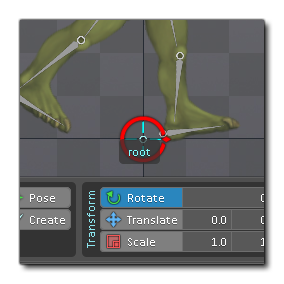 The root is where your Spine animation would be anchored within the world space, and when you import your sprite into GameMaker: Studio, this will be translated as the sprites x/y origin, which is not editable for this kind of sprite. Most of your calculations for moving parts of the skeleton will also depend on this point. When creating your animations, you set a pose and then create a key frame from the pose. After that you would advance the timeline for the animation and create another key frame. After doing this Spine will interpolate the bone data between the key frames to give a smooth animation, which can then be named and saved. You can create multiple animation sets for one sprite, and give each one a separate name which can then be used in GameMaker: Studio to set the skeletal animation pose for your imported sprite. There are also attachment "slots" available for your Spine sprite, and these are points where you can have your sprite draw a separate image that doesn't have a bone. It will then be moved along with the parent bone, permitting you to give your animation multiple sub-images for attaching within a single sprite. These attachment slots should be named appropriately, as should the images that they use, since these names will be used within GameMaker: Studio to change attachments at run-time. When you export a skeletal animation sprite from Spine as JSON, you will actually be creating three seperate files. the base JSON which contains all the bone data and animations, the .atlas file which has the data about how the textures are packed, and a PNG file which contains the texture atlas itself. 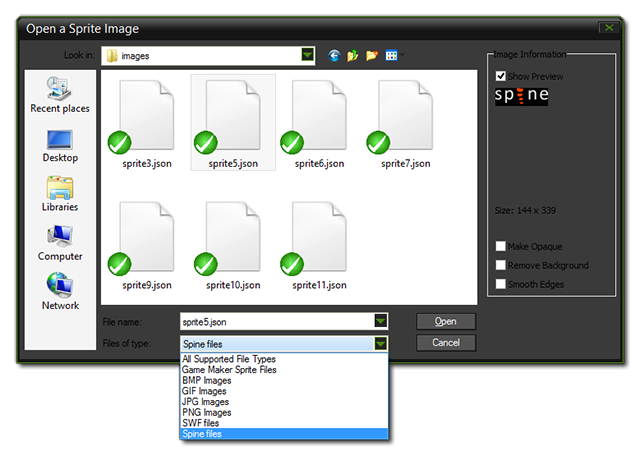 GameMaker: Studio requires all three files to create your Spine sprite, so they should all be in the same folder when importing. The way to import them into the GameMaker: Studio is almost identical to that for adding a normal bitmap image - you need to create a new sprite which will bring up the standard Load Sprite dialogue, and then make sure that you have selected .json from the file filter at the bottom, before browsing to where you have saved the Spine files and selecting the one you wish to import. Once you have imported the animation, you can set the collision properties, but note that you are limited here to simply using precise collisions or bounding box collisions, and that the collision data for a skeletal animation is explicitly taken from the data provided. 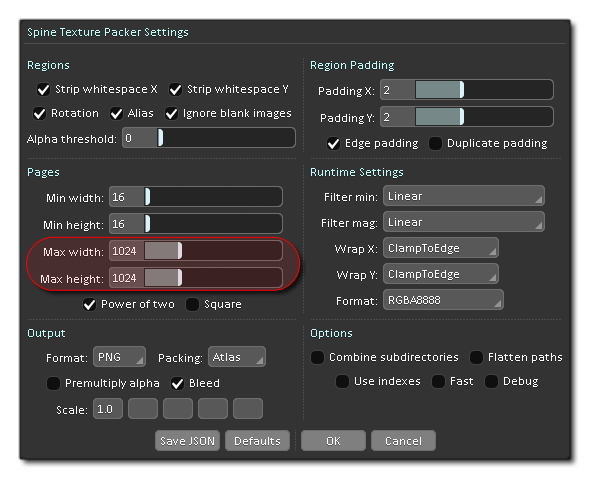 GameMaker: Studio does not generate any collision mask if the data is missing from imported file, meaning you simply won't get working collisions if the masks are not set correctly in Spine. Also, unlike bitmap sprites, the imported skeletal animation sprite cannot be modified in the editor in any way, meaning any changes that need to be made should be done in Spine and then re-imported into your game. Once the sprite has been loaded into GameMaker: Studio, you can use it as you would any other sprite. You can assign them to an object, or set them for an instance in code, and they will respond to most of the sprite instance variables too, so they can be scaled, rotated, coloured and have alpha values changed, all in-game. They can also be drawn using the extended drawsprite functions (with the exception of drawspritepos, and drawspritepart) as you would any other sprite. However, the point of using Spine is to create a skeletal animation sprite with multiple poses and skins, which that is most definitely not like a normal bitmap sprite. Therefor GameMaker: Studio has a host of new skeleton functions, as well as a new "Animation Update" event to deal with these types of sprite. The rest of this article will outline these functions and what they do, but you can find a full explanation of each one in the manual. This is similar to the above, but slightly more complex. Spine permits you to define bone animations for only part of a skeleton, and then create seperate animation sets for those parts and have them play together. Each animation is assigned to a track, with track0 always being the base, default, animation. In this way you may have, for example, a figure with a "walk" animation assigned to it, and this animation only affects the legs. You could then have various other animations where only the arms, or the head, or the upper torso, etc... are moved and assign one of them to track 1 using these functions. GameMaker: Studio would then play both animations together. This little function is possibly one of the most important ones when it comes to the final look of your imported sprite. You can change animations at any time using the above mentioned skeletonanimationset() function, but on doing so the imageindex will be reset to 0, which may make the transition "jumpy" as it goes from one pose to the other. now, with bitmap sprites this is expected and may even be desirable, but with skeletal animation sprites it looks odd and buggy. However you can remedy this by using the skeletonanimationmix() function which will interpolate the given animation sets so that they flow into each other in a natural way. For example, you can set a mix for your "run" animation into your "jump" animation, then set another mix for the "jump" animation to mix into the "run" animation and your sprite will now animate seamlessly between the two sets. A single skeletal sprite animation can have one or more skins, and these can be switched using the functions above. This means that you can have multiple characters in your game, and all of them with a different aspect but using the same base sprite animation. It is important to note that GameMaker: Studio only permits a single texture atlas per sprite, and so when you set up your Spine sprite, you should have a target platform in mind and target that for the texture page size. For example, if you are targeting mobile devices, you might want to have your spine texture atlas set for 1024x1024. While you would normally use the drawsprite functions to draw the skeletal animation sprite, there are times when you may want to draw extra data or a single sub-image of a single animation (for a pause screen, or a special effect, etc...). That's why these functions have been added, with the first of them simply flagging the collision data for drawing or not. If the flag is set to true then you will see the bounding box and the precise mask drawn over the sprite on the screen (this data is created when you create your sprite in Spine), while the second function permits you to draw the collision data for an individual frame of any animation. The final function is a bit different, in that it permits you to draw any frame of any animation with any skin, making it a powerful tool for testing things in-game. Note that although you can use this in-game for drawing a frame of a Spine sprite animation, it has a tremendous overhead due to the fact that GameMaker: Studio will have to do multiple calculations to correctly position the bones for the given frame, so it should only really be used as rarely as possible. As you can imagine from the outline given above, skeletal animation is an incredibly powerful tool. It permits naturalistic animations with a minimum of effort, and (thanks to the mix function) these animations flow into each other to create a very smooth user experience in your games. The skin and attachment functions available in GameMaker: Studio also mean that you can simplify the generation of multiple sprites from a single source, and even permit the player to customise them at run-time. Obviously, this is not a system that will be applicable to all games, but if you check out the Spine web site and demo, you will find that it is surprisingly versatile and well worth the time and effort required in making a sprite and importing it into GameMaker: Studio.